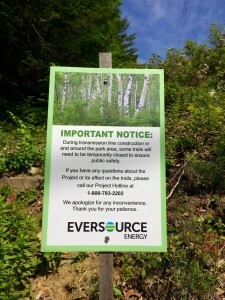 It’s hard to think about Eversource’s proposed Sudbury to Hudson transmission line without wondering what the 82 foot clear cut required for above ground transmission lines actually involves. After a scintillating review of the Five Year Vegetation Management Plan 2013-2017, (VMP), the answer is simple: cut tall trees and brush, use poisonous chemicals to stop them growing back, and do it again periodically to keep things clear. If that’s all you need to know, you can stop reading. But further exploration of how Eversource presents its plans to clear a path for its transmission lines reveals something more sinister. The entire 108 page document is an exercise in verbal acrobatics and corporate doublespeak. 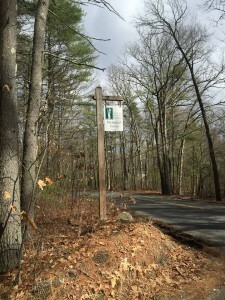 In the VMP, where we might see trees and bushes, Eversource talks of target vegetation and incompatible trees and brush. Chain saws, brush saws, rotary and flail mowers, and aerial lifts trucks in Eversource speak become merely mechanical controls. And the herbicides that are so upsetting to many abutters, hikers, walkers, and conservationists, those are simply referred to as chemical controls. There’s no talk of glyphosate products, ie Rodeo or Roundup, classified in 2014 by the World Health Organization as “probably carcinogenic to humans.” And although there’s a remedial spill and emergency plan and the technical reference materials refer to herbicide information, there’s no actual information about the herbicides, just information about the manufacturers and state agencies. If you’re not paying close attention, it almost makes sense – who couldn’t get behind supporting a healthier, more diverse habitat for wildlife? Except that Sudbury Valley Trustees and the Conservation Commission are already on the scene and strangely enough, they’ve made no recommendations for a herbicide application and mechanical treatment cycle to support healthier and more diverse habitats. SVT does engage high school students for invasive species removal in Memorial Forest and has an overall habitat restoration plan in the Desert Natural Area. It has been working with municipal, state, private, and federal landowners to protect and manage this area for over twenty years and works to rejuvenate habitat that supports the native diversity of the landscape. The Conservation Commission supports Sudbury’s extensive wetlands bylaws to protect the ecological integrity of Sudbury’s wetlands and surrounding landscape – be assured, habitat preservation through herbicide application and mechanical treatment is not on the menu. Both SVT and the Conservations Commission have written to express their opposition to Eversource’s project on environmental grounds with no reference to the potential for Eversource’s VMP to support healthier, more diverse habitats. The habitat that Eversource so proudly talks of supporting is simply the one that suits them – the one that is compatible with transmission lines. In the real world, the reality is that the linear clearing required by overhead power lines would alter natural dynamics as well as provide a pathway for predators and invasive plants. The open and low vegetation environment that characterizes power line corridors can be significant barriers in the movement of many bird, mammal, and amphibian species, all present in the existing priority habitat. And as for the human habitat, the clear cut will lead directly to the back yards of many of the homes of residents, with its visual and chemical impact. Eversource has a plan for that too.